This is the annual cost of a possible breakdown of the machine. The appearance of the same will depend on the operating regimes and the type of maintenance applied on the machine. In this case, we compared the FPAC of an offline maintenance, and of an online multi-technology maintenance. 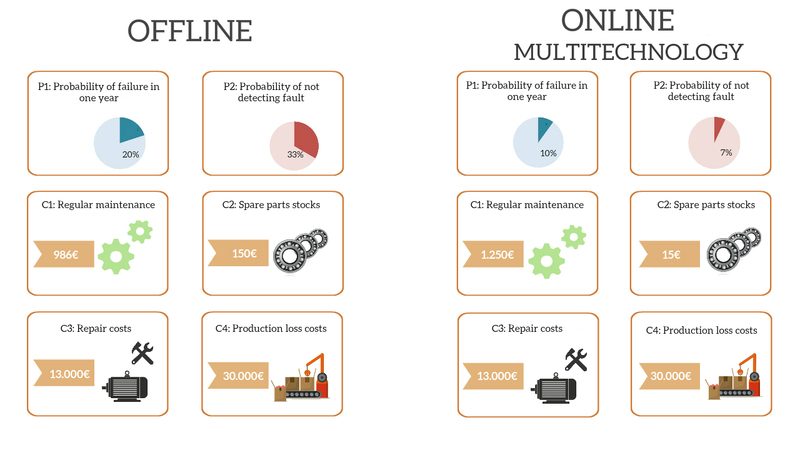 The cost associated with the probability of failure for an Online Multi-technology predictive maintenance system is 2 to 3 times lower than that of an offline maintenance system. Therefore, not applying multitechnology online predictive maintenance will be much more expensive than if we implemented it. Seen otherwise, with an Offline predictive maintenance system we are investing 1136€/year (C1 + C2) to have a serious breakdown every 15 years, while with Online Multi-technology predictive maintenance we are investing 1265€/year (C1 + C2) ), To have a serious breakdown every 142 years. Therefore it remains as an exercise for the client, to calculate his F.P.A.C and to know if it is profitable to apply online maintenance multitechnology, for its productive process and to reduce the probability of failure.